Samsung Galaxy S advance users can now taste Android 5.1.1 Lollipop on their Smartphones . Previously Polish Vodka ( Xda member ) booted Cm12.1 on Samsung Galaxy S advance . You can Download Cm12.1 for S advance from Here . 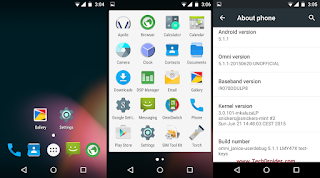 Android 5.1.1 comes with many bugs fixes and new options . Omni Rom is based on Cm12.1 which has many new features . We are not responsible for any damage caused to your Smartphone ! Try on your own risk , And follow the steps properly ! Step 4-Then select "install zip from sd card" and locate the Omni Rom zip you downloaded before.